IN FEBRUARY 2009 -- just one month after Obama's inauguration -- a series of policy announcements from the new administration startled and angered civil liberties activists because they amounted to a continuation of some of the most controversial Bush/Cheney war on terror programs. That led New York Times Pulitzer Prize-winning reporter Charlie Savage to observe that "the Obama administration is quietly signaling continued support for other major elements of its predecessor's approach to fighting al Qaeda," which was "prompting growing worry among civil liberties groups and a sense of vindication among supporters of Bush-era policies." In response, I wrote that while I believed "Savage's article is of great value in sounding the right alarm bells, I think that he paints a slightly more pessimistic picture on the civil liberties front than is warranted by the evidence thus far (though only slightly)." Yes, that's correct: Very early on in his administration, I defended Obama from the "he's-just-like-Bush" critique as premature. But six months later, the evidence piled up higher and higher that there was far more continuity with the Bush/Cheney model than almost anyone expected. As a result, I wrote in July that "in retrospect, Savage was right and I was wrong: His February article was more prescient than premature." Over the years, Savage has become one of the most knowledgeable and tireless reporters chronicling the civil liberties and war powers controversies under the Obama administration. The way in which that continuity has solidified what were once regarded as right-wing aberrations into bipartisan consensus -- strengthening the Bush/Cheney template far beyond what the GOP by itself could have achieved -- is easily one of the most significant, and one of the most disturbing, aspects of the Obama legacy. Savage has written a book that will clearly be the comprehensive historical account of these controversies. 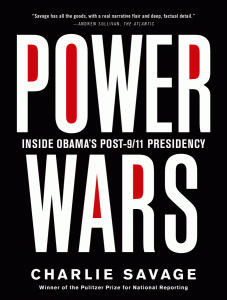 Titled Power Wars: Inside Obama's Post-9/11 Presidency, the book provides exhaustive detail on each of these questions (the book also early on recounts the exchange he and I had on these questions to help set the framework for the ensuing debates). Its most valuable contribution is the access Savage has to some of the key legal and policy officials responsible for these decisions, and the book thus provides a full account of their thinking and self-justifications. That makes his book simultaneously illuminating but also infuriating. Many of these officials are administration lawyers and their excuses for following Bush/Cheney -- or their denials that they have done so -- are often tendentious: dubious lawyer parsing at its worst. But Savage is an extremely diligent narrator of the thinking behind these debates, and the book really is essential for understanding Obama officials' (often warped) thinking and rationale that led to these policies. I spoke with Savage for what amounted to about an hour about his book. We could have easily spoken for hours. The discussion was occasionally contentious -- mostly because I find much of the self-excusing rationale of Obama officials that he conveys so dubious and often disingenuous -- but Savage and his new book really are an indispensable resource for understanding the nuances and details of these controversies, and his book is fascinating for those who have followed these debates over the Obama legacy on these questions.